NEW YORK (CNN) -- Not every classically trained musician has the gumption to interpret Michael Jackson on the violin. But German-born virtuoso David Garrett re-imagines "Smooth Criminal" with such fervor that you'd think Jackson had intended the song to be played by the instrument all along. 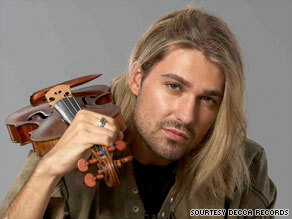 David Garrett uses his 300-year-old Stradivarius to play Mozart -- and Michael Jackson. "I always loved his performances because as a lot of classical musicians are perfectionists, he was," said Garrett of the late singer. "He was really one of those people who was really old school, always looking for better performances. [He was] definitely a big influence [on me]." Recorded before Jackson's death, Garrett's "Smooth Criminal" cover appears on his self-titled debut album, which has enjoyed three weeks atop the classical crossover charts since its release last month on Decca Records. As comfortable playing Bach's "Air on the G String" as he is Metallica's "Nothing Else Matters" (both of which appear on the album), Garrett makes no bones about the fact he's trying to attract a younger audience to classical music by injecting shots of rock and pop. Already a celebrated artist in Europe and Asia, the 28-year-old worked his way into the spotlight in the United States with help from his PBS special "Live in Berlin." And his chiseled jawline and playful blond ponytail seem to help sway the female contingent. After spotting him recently on NBC's "Today Show," actress Kirstie Alley declared on Twitter that Garrett was her new crush. David Garrett recently dropped by CNN and shared his (humble) theory of why he often gets called the "David Beckham of classical music" and why he thinks the genre has failed to enthuse young music listeners in the past. CNN: So who's cooler: Mozart or Metallica? David Garrett: Oh they're both in my world very, very cool. And they both have a huge influence on my performance and what I play on stage. CNN: When you mix pop and rock with classical music as you do, do you get the cold shoulder from classical purists? Garrett: About 70 percent of my concertizing is core classical. So most of them know that I've been pretty much a very conservative classical artist all my life. ... I just use these semi-classical works in order to get younger people interested in what I do when I play the Beethoven, the Bach, Mozart, Tchaikovsky, which is a big piece of my heart. CNN: It has always been difficult for classical musicians to bring in a younger audience. Is it working in your case? Garrett: To be honest I don't think people are trying. I think somebody like Yo-Yo Ma, or ... [Leonard] Bernstein, those are people who really got out and promoted classical music. But I think a lot of my colleagues just don't really realize that they have to work in order to get the interest of an audience, especially with young kids, especially because it's not that popular anymore. You don't see it on TV, you don't hear it on radio, so you really gotta put an effort into promoting classical music. CNN: Was your move to New York pivotal in helping you decide to introduce rock and pop? Garrett: Yeah, probably. When I went to Juilliard, most of my friends were ... from the dance and the drama division. When they took me out, it was more to rock shows or R&B stuff. They exposed me to a lot of music which I wasn't really into at that point. I really got excited about it and just tried to make it my own thing. Violin for me is a great instrument because you can use it as a rhythmical instrument and also as a melodic instrument. ... You can pretty much do everything with the violin. Sometimes I feel classical music limits the violin. CNN: You modeled on the side while you were at Juilliard. So are you the David Beckham of classical music? Garrett: I always think people say that, how I kind of try to explain it to myself ... [is] basically he kind of opened up football to a whole new audience. CNN: That's not why they say it. Garrett: Well, this is how I'm explaining it to me! He kind of drew a new audience to football, OK mostly female, but that's not a bad thing. ... I think that's why people actually say that because they know I really try very hard to get new audiences for classical music. CNN: Tell us about your violin. It's a Stradivarius? CNN: So how old is it? Garrett: [It was made in] 1717, so it'll be 300 years old in a couple of years. CNN: Do you have to do anything to take care of an instrument that old? Garrett: They're pretty substantial instruments if you don't drop them, if you don't sit on them, or if you don't throw them around. CNN: Didn't you break one of your violins? Garrett: Yeah, I did fall on one a couple of months ago. It's not that I did it intentionally. It was a very unfortunate accident. I was very upset for a very long time. CNN: If you could choose one word to describe yourself, what would it be? Garrett: Diplomatic. Because I'm always try to get people together. You always have to be diplomatic with music, with classical, with whatever you do.